I think I’ve finally got my overnight makeup bag packing down to a fine art. I’m always moaning that Mr. L expects me to take about 3 items away with me yet still somehow look like a human being. I thought I’d share what I took with me when I went on an overnight jaunt last time. My requirements are simple. Long-lasting makeup with the least amount of application time. The key to this (for me at least) appears to be some simple layering. Firstly, brushes. I don’t take any of my good ones… I’ve thought about purchasing some of those brush guard thingies… but they’re such a boring and practical purchase and I’m always finding more exciting things to spend my money on instead! A mascara spoolie, slanted eyebrow brush, cheapo no7 eyeshadow brush, Une Cosmetics flat top kabuki and my Pout Airbrush see me through a couple of days well. Because I’m out and about all day, I need my makeup to go the distance and I’m finding a few key products are seeing me through the day. Most importantly, I want my base to last and at the moment, I’m finding a combination of Bourjois Healthy Mix set lightly with Bare Escentuals Matte is seeing me through the day nicely. Cheeks are a combination of Une Cosmetics Creme Blush in B02, with a light dusting of Bobbi Brown Illuminating Bronzer in Maui ontop. My ever-faithful, ever-present Urban Decay Primer Potion gets packed time and time again and a combination of creme/liquid (Chanel Ombre D’eau)… and powder eyeshadows (Shu Uemura) remain solidly on my lids all day. Diorshow Iconic and a Kajal eyeliner are foolproof to apply and never give me bother in the mornings. The kajal smudges as the day goes on, but any errant smears are quickly wiped away whilst the majority of the product stays nicely between my lashes. I never wear full-on lip colours when I’m travelling simply because they’re too high maintenance, I chose to take my Guerlain Maxi Shine with me this time… light yet long wearing, I’m definitely looking to increase my Guerlain lipstick collection! God, that was a dull post… I’m absolutely dying up here on this poop laptop with weird colours. I have many posts in my head and pictures to resize and edit, but the colours are so squiffy on this monitor that I don’t wanna upload anything colour crucial. You’ll wonder why I’m wearing a green lipstick or something! Thanks for this post. Packing toiletries, makeup and perfume is my favourite part of getting ready to travel – I love choosing minimal items for maximum impact, and it shows me what I really rate in my collection as I tend to only pick the things that work. Thanks for letting us peek at what you think is essential! I liked this post! where did you get the pout airbrush – lucky thing! I like this post, it’s interesting to see what other people take with them- you’ve got it nailed more simply than me! Good kit – I’ve never got the hang of packing light! Hi Charlotte, what’s your shade for Healthy Mix? I use 51 (Vanilla Light), so it’d be really helpful for me if I know your shade … (easier to figure out how stuff you use will look on me). I’m facing a similar dilemma too — just that I’m going to move to London and staying there for the next few years … I simply don’t know what to take with me. is that a little illamasqua under eye concealer i spy? is it any good? great post,love seeing what people take? Don’t be daft, it’s a great post. I really do try to be as sensible as possible about make up for an overnight jaunt (we’ll gloss over the fact that my overnight bag is the same as most people’s regular make up collection ;P). I was pointed in the direction of the Ombre d’eau eyeshadows for the first time today and they are stunning. I really need invest in one of these. Which colour is it that you have? I am so much worse than that, I literally take half of my makeup wherever I go! 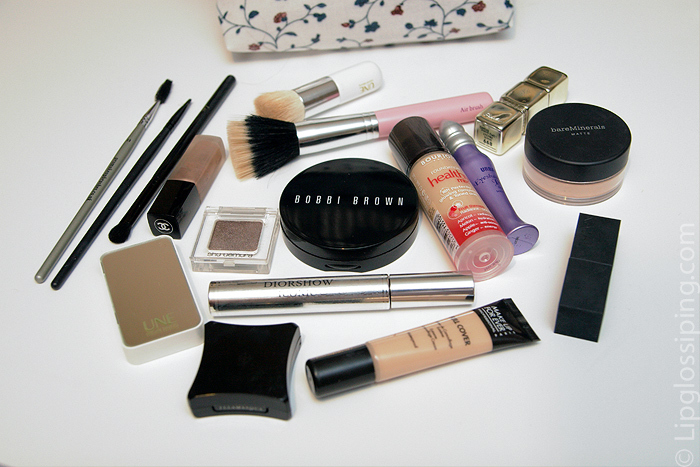 I love packing makeup for travel!! I think I’m getting better at it – I used to take a huge choice of colours but have since realised that when I’m traipsing around Paris in sun or rain, the last thing I want to worry about is whether my violet eyeshadow is working its way down my cheeks. So these days I stick with soft neutrals that stay in place well. Anyway, thanks for sharing, I love seeing or hearing about what other people pack for their travel kit!